Humanitarian aid convoys bound for Syria from Turkey are supplying arms to militants, Russian Foreign Minister Sergey Lavrov [pictured left] said at the High Level Segment of the UN Human Rights Council session on Tuesday. 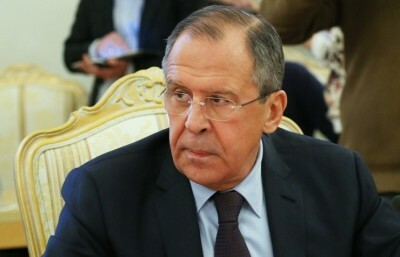 « A special task is to cut short terrorists’ supplies from outside, for which purpose it is necessary to close the border of Syria with Turkey, through which arms are being supplied to gunmen, including in convoys with humanitarian aid while the journalists who have reported about this are put on trial and sentenced to many years in prison, » Lavrov said. « Incidentally, this is about the freedom of speech, » the Russian foreign minister added. According to Lavrov, Syria can be restored only through a durable ceasefire and the commencement of the pan-Syrian inclusive dialog. « It is possible to solve humanitarian tasks radically and switch to restoring the war-ravaged country only by ensuring a lasting ceasefire and commencing a truly inclusive pan-Syrian dialog on the future of Syria, which should be determined by the Syrians themselves without interference from outside, » Lavrov said. « Naturally, neither the ceasefire accords nor the process of the political settlement have any place for terrorists and extremists whose ideology and practice are incompatible with the principles of the existence of the human civilization, » the Russian foreign minister said. « Inflicting a decisive defeat on the Islamic State, Jabhat al-Nusra [terrorist groups outlawed in Russia] and similar groups is an inviolable condition for ensuring the rights of the long-suffering peoples of Syria, Iraq and, generally, the region of the Middle East and North Africa, » the Russian foreign minister said.